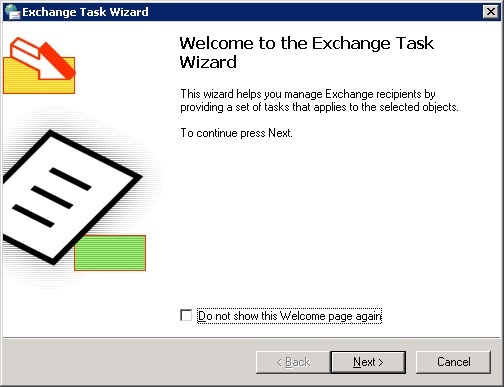 After completing Part 1, I next decided to deploy a second Exchange 2003 server which would be used as a Front-End. I followed the deployment steps from the previous posts, with the exception of dropping the 2GB memory down to 1GB, not assigning a 50GB partition from the SAS disks, but assigning a 10GB drive from the SSD's to be used for the Mail Queue. 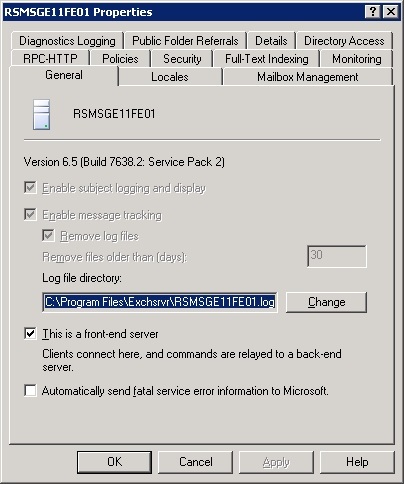 I deployed this server as RSMSGE11FE1. 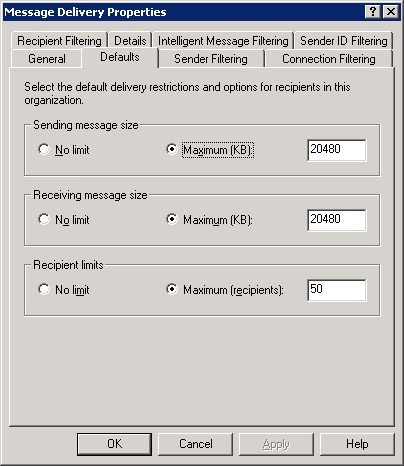 Next, I went into Global Settings, on the Defaults tab I upped the maximum inbound and outbound message size from 10MB to 20MB, and dropped the max recipients from 5000 to 50. 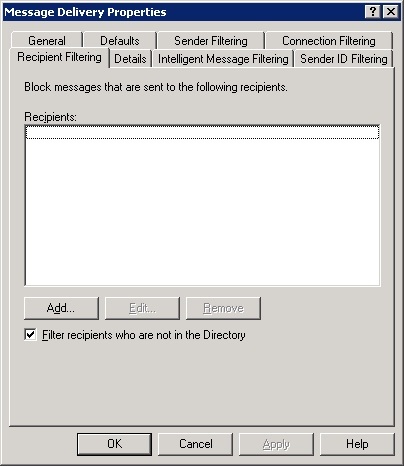 Then, on the Recipient Filtering tab I enabled filtering of recipients who are not in the directory. 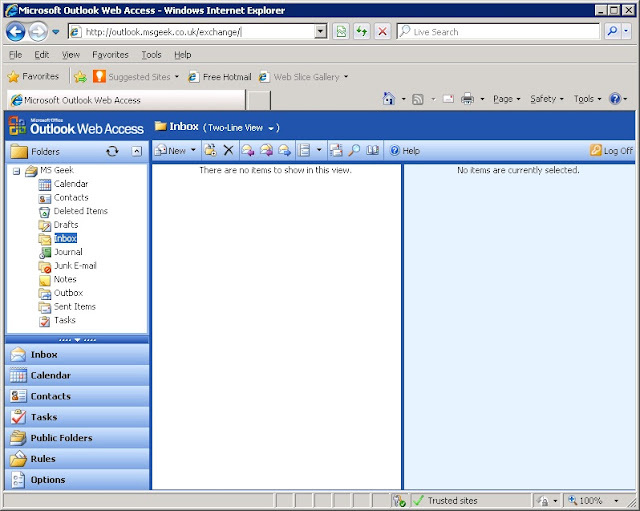 I then went into properties of the Front-End server, and selected the option designating it as a Front-End server. 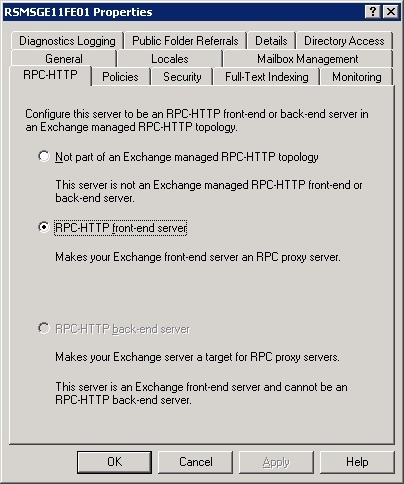 Then, on the RPC-HTTP tab I set the Front-End server as a RPC-HTTP Front-End server. 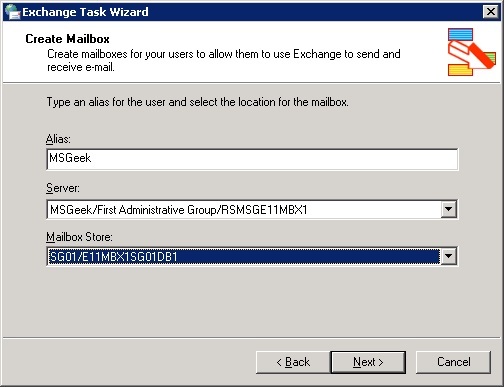 Next I wanted to create a mailbox, so I fired up ADUC, and loaded the Exchange task wizard against the msgeek user I created earlier. I chose to create a mailbox. I placed it on SG01 DB1. 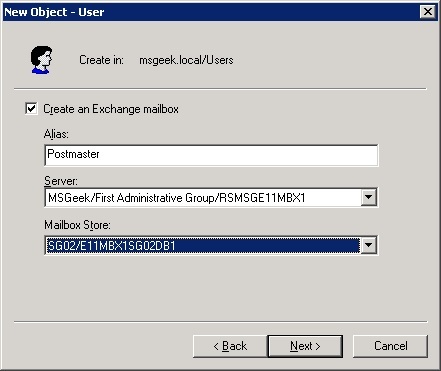 Whilst in ADUC, I also created a Postmaster mailbox, placed it on SG02 DB1, and disabled the associated Active Directory account. 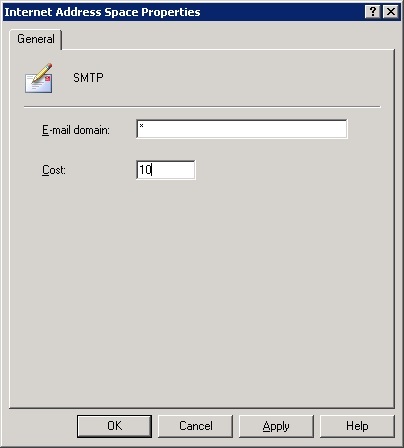 Next, I went back into ESM, and into properties for the Default SMTP VS on the Front-End server. On the Access tab, I went into Authentication, then Users, and granted Authenticated Users Relay Permission. 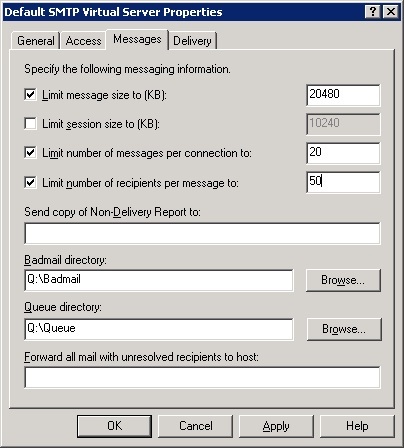 Then, on the messages tab, I set the same limits I configured in global settings, and moved the queue and badmail directories to the Q drive on the SSD storage I created when provisioning the server. Next, I went onto the Delivery tab and clicked advanced. Here I modified the Fully-Qualified domain name to be something a little tidier. I also added this hostname to internal DNS. I didn't add this to public DNS which I won't be touching (meaning no MX records and no inbound mail) until much later in the lab build when I start looking at the edge role. 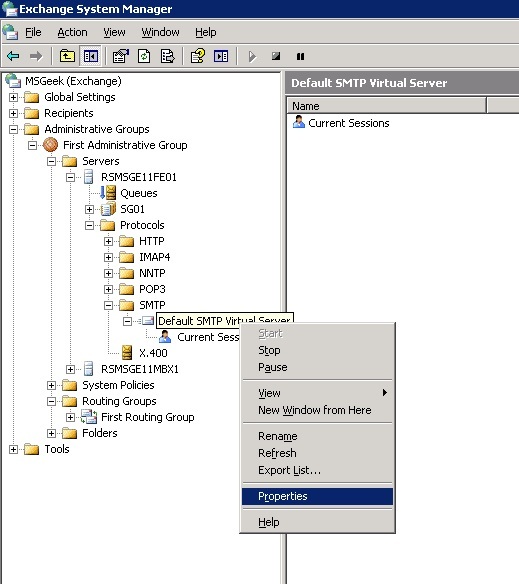 I then went into the first routing group, and chose to create a new SMTP connector. I named the connector Internet Email and configured it to route through the relay I had been provided by Redstation. 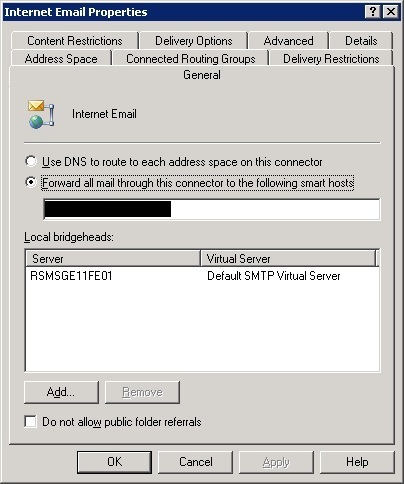 I also added the SMTP VS on the Front-End server as a local bridgehead. 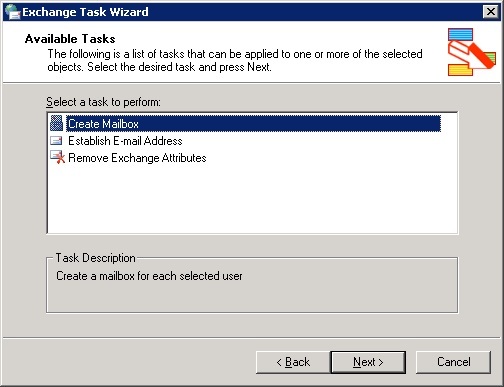 On the email address space tab I added a new wildcard SMTP address space with a priority of 10. Next I wanted to check that the SMTP VS was working correctly, initially I wanted to ensure there were three types of distinct behavior that were working as desired. Emails to external domains should be rejected when there is no SMTP authentication. 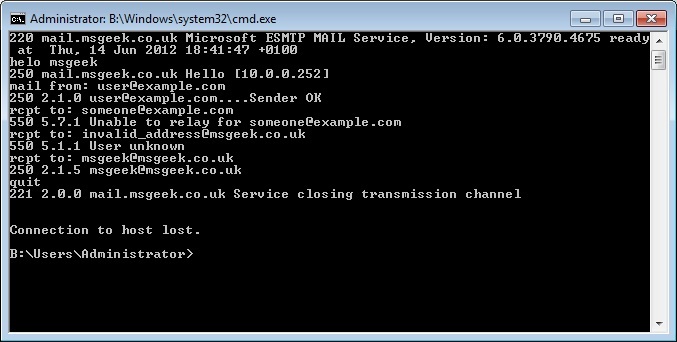 Emails to @msgeek.co.uk should be rejected if the address before @ does not exist. Emails to @msgeek.co.uk should be accepted if the address before @ exists. This behaviour can be tested via a single telnet session to the SMTP VS by use of three different RCPT TO: commands. 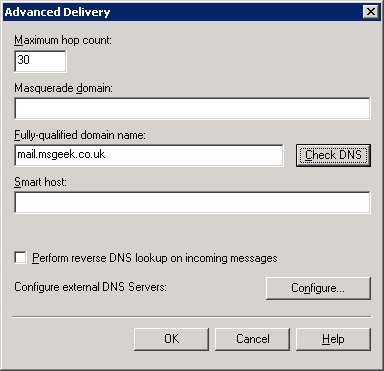 One to an external domain, One to an invalid address @msgeek.co.uk and one to a valid address @msgeek.co.uk. As you can see from the screen shot below, all three tests came back correctly. 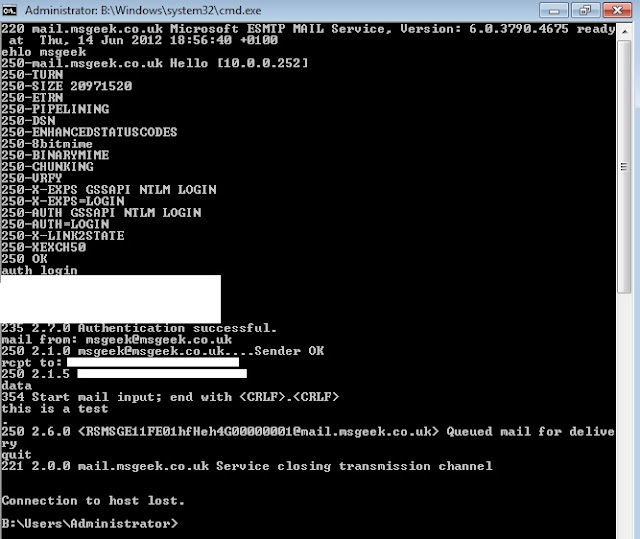 Next I tested outbound mail flow when SMTP authentication is used. 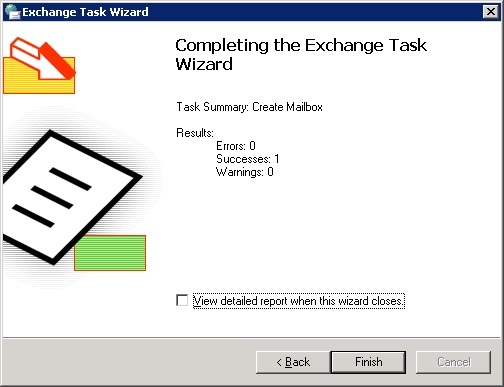 The test message was recieved by the external mail system correctly. 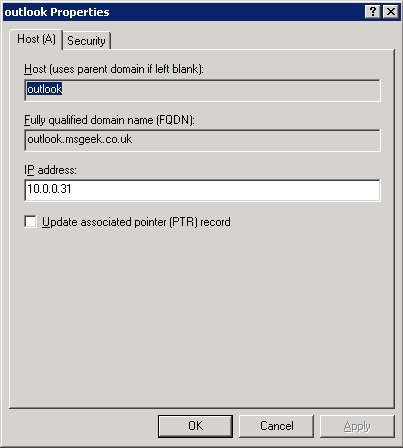 I then added outlook.msgeek.co.uk to internal DNS pointing to the internal IP of the Front-End server. 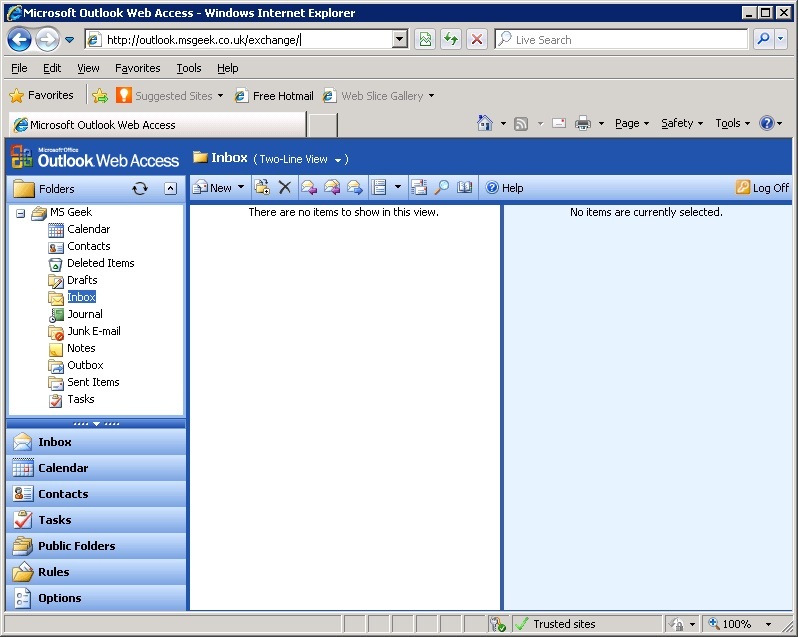 I then navigated to the OWA page and verified I could access OWA and it was working as expected. It was all looking good as expected. There are a few minor configuration changes I still want to make, but I'll be visiting some other components in the deployment next.